I would like to show all of you some of the work that I have been doing. I am currently the assistant costume designer for "Urinetown: The Musical " that is being produced by PCPA Theaterfest in Santa Maria, CA. As a part of my duties I was asked to design two tattoos that will be used in the show. 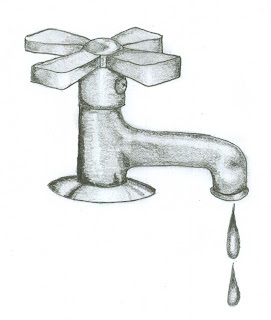 This is a faucet that I modified from a clip art photo I found online. The actor asked for a tattoo with a water reference. If you know anything about the musical, it makes sense that it's dripping. Possibly showing desire for water, or possibly the drops represent how many times he's pee-ed illegally. Who knows. The story isn't mine to make up, just the tattoo! Here is a lady that I was told to design and I used vintage Vargas pinups as inspiration. The actor didn't get any input on this one, but the designer and I had fun! She has a water reference as well, she is wearing a bathing suit. Albeit one that would fall off if she removed her hands. I really had fun doing this one. Other than that, nothing really new is going on. Just working. The summer is quickly coming to an end, and I am excited to get this show open.